Content repurposing not only takes the pressure off for marketers, who don’t have to come up with new content ideas each time, but also has other benefits. Creating high-quality content on a regular basis can become challenging, especially for small companies and startups who don’t have many resources at their disposal. Not to mention that content that is not distributed becomes useless. 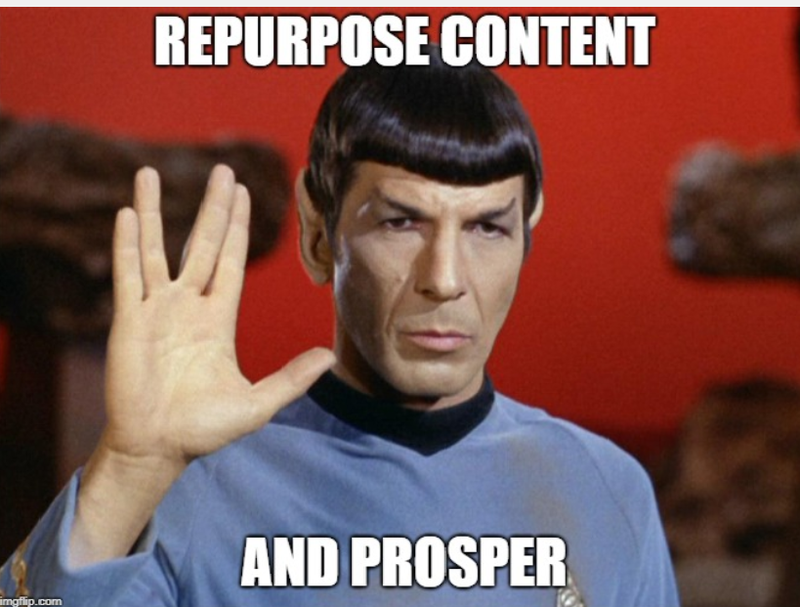 Why should marketers repurpose content? Even if your website gets decent traffic, it does not mean that you have reached your full content marketing potential, so repurposing the content you already have can help you attract more customers. This is, perhaps, the most obvious benefit of repurposing content in a new format. Some users might prefer watching a video or listening to a podcast on their way to work instead of reading an article or a guide. Distributing the content on different platforms will also help you reach new audiences who, otherwise, would not have heard of your brand. The Rule of Seven states that customers need to hear the same message about seven times before they take action, so it’s not enough to post your content once and forget about it. And that’s why promoting your content under different formats and on different channels is useful – you are repeating the same message without becoming boring or annoying. 51% of all website traffic comes from organic search. Again, repurposing content under different formats and on different platforms can improve organic visibility and traffic. And not only that but publishing your content on other websites will help you (most of the time) get backlinks, which are very important for any successful SEO campaign. What kind of content can be repurposed? Although content repurposing comes with many benefits, not all content is suitable for repurposing. You should only repurpose content that’s evergreen in nature. What does that mean? SEO content that stays “fresh” for readers, content that continues to be valuable and relevant over the months (over the years would be even better!). Head over to your Google Analytics, analyze these metrics and find out what your most popular posts have been over the past year. Below you will find 12 ways to repurpose content and increase traffic on your website. If you’ve blogged for a while, chances are you might have covered a specific topic more than once – you can combine all those articles and create a complete guide. Depending on how old the blog posts are, you might have to update some of the information. Then, you can include the guide in your email marketing strategy to attract more leads. If you’ve got a decent subscribers list, you should consider distributing your articles as a weekly tips & tricks newsletter. No matter how much your customers love you, it’s impossible to keep up with every single one of your blog posts. So you can curate a list and send it to them via email to urge them to interact with your best pieces of content. Not everyone has the time to go through a lengthy blog post every day. However, people spend anywhere between 30 minutes and 2 hours a day commuting to and from work, so you should take advantage of that time and turn your blog posts into podcasts. Don’t worry if you don’t have the right equipment. If your blog uses WordPress, you can just install a plugin and let the AI do the rest. But for the best results, we recommend you outsource this job to a professional. And, of course, this can work the other way around too – turn your podcast into blog articles and take advantage of all the distribution channels available to you. This strategy is extremely useful if you’re trying to rank for particular keywords. Almost 5 billion videos are watched on YouTube every single day. Video is a huge trend, and in the next years, it will grow even more. One major advantage social media videos have over blog posts is that, on most platforms, they begin to play as you scroll through your feed, and once it catches their eyes, most users will watch the video until the end. This is extremely useful especially for videos that users wouldn’t have clicked on otherwise. Although video is a huge trend, some people might still prefer written content, especially if the information was in-depth and they want to go over it again. Turning videos into blog posts is pretty easy; you just have to write the transcript and edit it here and there. The same works for blog posts too: turn them into videos and drive new visitors to your site. If you do lots of tests, either for yourself or for your clients, you could share the results with the community and position yourself as a subject matter expert. Structure your findings, add any Excels you’re using, screenshots, and conclusions from emails, and your case study is ready to be published on your blog. Alternatively, you can save your case study as a PDF and include it in your lead generation strategy (meaning that people will need to leave their email address to be able to access the case study). Think of infographics as visual representations of all the data you have gathered in your case study. Visuals are way easier to digest than written content, and they get shared on social media a lot more. Tip: for best results, structure your infographic the same way you would structure a blog post. Make sure you have a title/headline, sub-headings, and a conclusion. Both marketers and users love interviews. The reason they are popular is because they are easy to plan (you just have to email a set of questions to different industry professionals), easy to edit (because you’re not writing the article from scratch, you just put together other people’s answers), and they reach a lot of people (because the professionals you’ve interviewed will promote your content within their network). Repackaging interviews into an expert advice e-book is not difficult at all (you’re using the same content but changing the medium), plus you have the opportunity to reach new customers who may have missed your interviews the first time. If you’ve got a quote from a well-known industry professional in your article, a testimonial, or even a punchline that you’re really proud of, you should consider tweeting them along with a link to your blog post. Granted, you may have already shared your article on social media, but often times punchlines perform better when it comes to engagement. Besides, the frequency of posting on Twitter is higher than the frequency of posting on any other social media platform, so you should share your content a few times with a different copy to make sure you reach as many followers as possible. Punchlines from older blog posts also come in handy when you don’t have fresh content to share. Add the link to the article to your tweet as well to redirect new traffic to an older page. Google likes updated content! So, as you gather more data about a specific topic, instead of creating a new blog post, you should consider updating the old one. Otherwise, all the effort you put into making that article have a good rank will be for nothing because you’ll need to repeat everything all over again. Although this method does not really count as repurposing content, more like making old content relevant again, it’s a very good SEO tactic, and it also helps bring new people into the discussion. Don’t underestimate the power of an FAQ page! For starters, those are questions that your customers have, so you know for sure that this content will be well received. Another benefit of having an FAQ page is that it will help your support team become more efficient. Instead of answering the same questions again and again, they can focus on more specific problems. Last but not least, for each piece of content that you create, you should think of all the different platforms where you can share it. If you’ve got a blog, you could consider posting some of your articles on Medium, if you make YouTube videos, you can re-upload them on Vimeo and so on. We’re curious to know: how many of these content repurposing methods are you using? Do you have any other methods of repurposing content? Let us know in the comments below! Now that you know how to repurpose your content, make sure you properly distribute it. More on content distribution here.